I'm looking for ink cartridges for my Epson XP-720 printer but you only seem to have a choice of four cartridges and I want five. Is there a problem with this? Epson only manufacture 4 colour Epson 26 / 26XL ink multipacks so for printers that take five cartridges, such as the XP-720, you'll need to buy the photo black Epson 26 / 26XL ink cartridge separately as it isn't included in the multipacks. The Epson XP-720 is a multifunction printer ideal for busy households. This model delivers high quality photos and it can even work without a PC. The Epson Expression Premium XP-720 all-in-one photo printer features an LCD display, where users can edit photos before printing, such as photo enhance and red eye removal. With standard networking connectivity, users have the freedom to scan and print anywhere. The Epson XP-720 colour inkjet printer also offers dual paper trays and can be run on high yield Epson 26XL ink cartridges for a lower cost-per-print. The sleek Epson XP-720 Expression Premium printer weighs a mere 6.9kg and measures 390 x 341 x 141mm. It offers USB and Wi-Fi connectivity and also comes with a memory card slot and PictBridge port. There's a 10.9cm touchscreen display and a single function button for power. 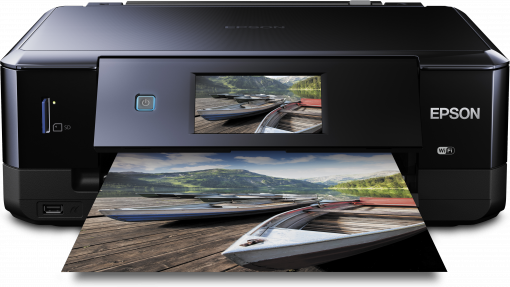 The Expression Premium XP-720 has a flatbed scanner on top and a 100-sheet paper tray and 20-photo sheet tray as well as a rear paper path for special media. The versatile Epson XP-720 all-in-one can print on a wide range of media, including CDs and DVDs. This model is ideal for photo printing as it offers borderless printing and even offers a PictBridge port for direct printing from digital cameras. The print speed of the XP 720 multifunction printer is quite fast at 32ppm for monochrome and colour and 12 seconds for 10 x 15cm photos. To reduce paper waste, the Expression Premium XP720 Wi-Fi all-in-one printer is integrated with a duplexer. The Epson XP720 photo printer supports cloud access and mobile printing. Although the Epson XP-720 all-in-one wireless printer has decent paper handling capacity, there’s no option for extra trays. This model doesn’t offer fax functionality or have an ADF.